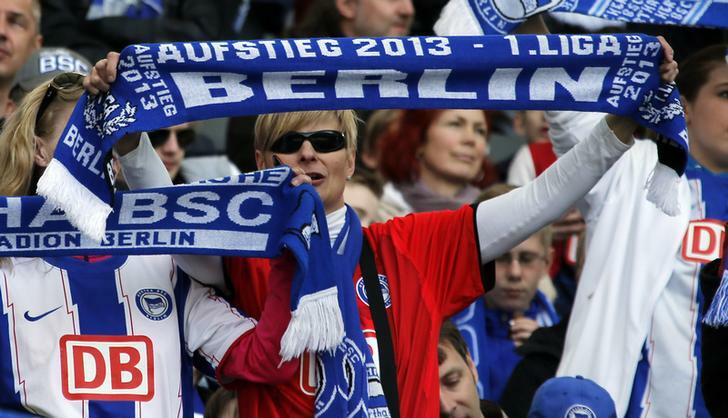 The buyout group is investing 61 mln euros in Berlin-based team Hertha BSC. The club is struggling financially and mediocre on the pitch. A thriving Bundesliga tournament and a booming Berlin suggests potential. But turning Hertha round looks a long shot for private equity. Hertha Berlin supporter celebrate before their German second division Bundesliga soccer match against SV Sandhausen in Berlin. U.S. buyout group KKR agreed to take a 9.7 percent stake in Hertha Berlin in a deal worth about 61.2 million euros, the two sides said on Jan. 31. KKR has the option to increase its stake to 33 percent. The strategic partnership between the club and the private equity group is supposed to run for at least seven years. German companies Adidas and Audi own similar 9 percent stakes in Bayern Munich, and Russia’s Gazprom has a long-standing sponsorship partnership with Schalke 04. “This partnership with KKR as a major investor is a quantum leap for the club and its financial side,” said Hertha Chief Executive Michael Preetz, whose club has twice been relegated in the past four seasons.